A range of factors drives clinician burnout, including workload, time pressure, clerical burden, and professional isolation . Clerical burden, especially documentation of care and order entry, is a major driver of clinician burnout. Recent studies have shown that physicians spend as much as 50 percent of their time completing clinical documentation . Nurses similarly spend up to half their time fulfilling clinical documentation requirements and data entry for other demands such as quality reporting and meeting accreditation standards . In the outpatient setting, patients will often describe clinical team members going through mundane questioning and computer documentation, often duplicative, and spending little time making eye contact and talking to them, or performing physical examination . With the exception of improving medication safety, nurses and other clinicians report dissatisfaction with the design and cumbersome processes of electronic documentation . Many clinicians feel they are compelled to first satisfy the demands of documentation in the clinical record. After caring for patients, many clinicians devote significant amounts of time to nonclinical activities, which often carry on into afterhours. This paper explores the relationship between clinical documentation, the electronic systems that support documentation, and clinician burnout, and provides recommendations for addressing these issues. Clinician well-being and fulfillment in work is critical for patient safety and health system function . Fulfillment in work has been ascribed to three factors: (1) mastery: competency and proficiency in the work to be done, (2) autonomy: having some element of influence over the way work is performed, and (3) purpose: a connection to filling a societal need in an environment where one’s profession is honored and valued . The current epidemic of clinician burnout is related to these factors. Clinicians increasingly feel burdened by administrative tasks that seem to not add value to patient care and are unrelated to the reasons they chose their professions. The disconnect between one’s calling and one’s daily work contributes to distress, and can lead to alienation, isolation, depersonalization, cynicism, emotional exhaustion, and burnout. Clinical documentation began when physicians recorded case reports of a patient’s course of care . These case reports evolved into records used in teaching others the practice of medicine. Although the original impetus for clinical documentation was to tell a patient’s story and describe that person’s treatment and progress, recent history has seen an increasing shift toward tailoring documentation to fulfill billing requirements. Several major forces led to changes in clinical documentation. First, as a component of public funding (Medicare and Medicaid), documentation of services became a requirement for payment, because federal payers needed to ensure that taxpayer funds were appropriately spent and beneficiaries received medically necessary services. Additionally, payers had to guard against fraud. However, payers are requiring increasingly detailed documentation to provide reimbursement. Similarly, private payers have increased administrative oversight in the form of administrative preapproval processes and very specific documentation criteria to reimburse for drugs and procedures. These requests encourage the generation of boilerplate text, templates, check boxes, and other documentation tools that fulfill billing purposes but can produce documentation of limited clinical value and also add time to the documentation process . Movement away from detailed documentation of each care process to a focus on rewarding patient outcome is potentially beneficial. However, the management of the transition and the specified documentation approaches for outcome measurement will directly affect the potential benefit. The second factor influencing the change in clinical documentation was computerization of the patient medical/health record. Early systems fulfilled the need to collect data from different sources (pharmacy, laboratory, transcription). These electronic health records (EHRs) were often used to support billing and collections, and not necessarily clinical needs and workflow. Next, computerized provider order entry systems (CPOE) were introduced that use described guidelines for care and checklists in the form of electronic order sets. CPOE offers advantages over traditional paper-based order-writing systems, such as improved accuracy in ordering services and the avoidance of problems associated with handwriting legibility. However, CPOE interrupts the traditional workflow of order entry. The way electronic order sets conceptualize workflow often does not align with actual practice. For example, ICU physicians are often alerted to emergent needs for medication orders by the bedside nurse, who monitors the patient closely. Nurses were previously able to write verbal orders from the physician, with physician signature later, sometimes after administration of the medication. In contrast, CPOE workflow requires the physician to enter the order as well as sign it . Further attention to the design and implementation of CPOE is necessary to realize its full potential benefits. The third factor that changed workflow was the introduction of patient confidentiality rules and regulations within the Health Insurance Portability and Accountability Act (HIPAA). Although HIPAA introduced important privacy protections for patients, the law also led health systems to limit the use of tools such as the problem-oriented checklist, names of patients written on the rooms or central locations, and many other basic forms of communication. A continued shortcoming of modern systems is adherence to tedious detailed documentation requirements to satisfy payers and regulations. We have yet to design systems to support the premise that clinical documentation exists to support the care clinicians deliver to patients, and other functions should be a secondary goal. By creating a specific task out of every element of information, even with the use of checklists and reporting by exception, clinicians’ time is adversely affected. In part, this is perpetuated by the myth that “if it isn’t documented, it wasn’t done .” Much of this has been driven by linking documentation to payment. This demand has perpetuated the perception by clinicians that payers do not fully trust them. The perceived overdocumentation of process fuels resentment that payers are supplanting the clinician’s professional judgment regarding the care that needs to be provided. Centers for Medicare and Medicaid Services’ Evaluation and Management (E/M) coding guidelines offer a good example of the challenges in completion of document requirements. E/M codes require attestation of various elements of the patient’s history, including review of 14 systems (e.g., respiratory) and physical examination to support the level of payment requested. There are five levels of payment, which are determined by a tabular interplay of four levels of medical history, four levels of physical examination, and four levels of medical decision making . This results in abundantly detailed documentation, which is necessary for billing purposes, and, with the exception of medical decision making, is often clinically irrelevant . The EHR compounds this problem by facilitating the collection of many redundant or irrelevant details. Another challenge is that some institutions over interpret E/M coding guidelines and require that only physicians can directly enter elements of the History of Present Illness (HPI). In addition, limitations are sometimes placed on clinically trained staff (medical assistants or nurses) such that they must sign in and out of roles between clerical and clinical tasks, and that the HPI drafted by an MA or nurse during rooming does not count for billing. EHRs provide a nexus for information input and retrieval among complex health care systems and environments. However, there are challenges in the use of EHRs that affect clinician burnout. The Health Information Technology for Economic and Clinical Health (HITECH) Act of 2009 provided the financial support and incentives to accelerate the adoption of computerized patient records. Through the Meaningful Use (MU) Program of HITECH, eligible providers and organizations could garner significant funding to offset the costs of implementing EHRs with the intention of optimally using the data to improve the patient experience, as well as quality and cost of care. The rapid pace of implementing systems that were available on the market at the time discouraged many clinicians and organizations from taking the time to redesign workflows, or insist on design changes in EHR systems that would better support clinical care. What was not envisioned was that the electronic systems would exact more benefits for those other than patients and clinicians—e.g., automated claims for third-party payers. Currently, most sites of clinical care use EHRs, which include electronic prescribing (pharmacy information systems) and CPOE [14,15]. 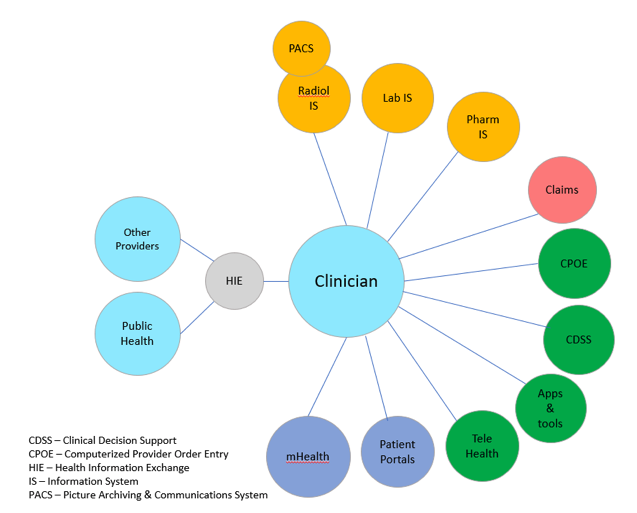 These systems often connect to clinical decision support systems (CDSS), laboratory, radiology, telehealth, mobile health, patient portals, and health information exchange systems (see Figure 1). CDSS are designed to aid clinical decision making by providing patient-specific assessments or recommendations. When MU incentives rapidly advanced the implementation of EHR systems, it brought along the breadth of features listed above. Also for health care providers, MU brought enhanced use of structured data elements, and significant changes in workflow. Although some positive process and outcomes improvements have been reported with the use of CPOE and CDSS systems, the overall results are mixed [16,17,18,19,20,21]. There is evidence for enhanced quality and safety, but there is also risk that distractions caused by associated clerical burden can contribute to safety issues . Physicians who do use CPOE experience 30 percent higher rates of burnout than those who do not . Several studies document that physicians and residents spend 50 percent or more of their time using EHR systems for documentation, ordering tests, reviewing results, and communicating with patients or team members [22,23,24]. Furthermore, nurses also spend up to 50 percent of their time on documentation . From the early inception of electronic documentation, appropriate mechanisms to encourage direct clinician input have proved to be a challenge. CDSS often provide alerts (such as drug interactions and reminders) to health care providers as they use the EHR. Efforts of health systems to improve quality and performance along with MU requirements have led to widespread use of CDSS and alerts. However, a high percentage of alerts are routinely bypassed [25,26]. Another feature of EHR systems, inbox notifications, also consumes clinician time—a recent study estimated that physicians spend an average of 67 minutes per day processing these notifications . As a result, the utility of such notifications should be optimized and warrants further investigation. Personal health records that store health data input by the consumer or from other data sources have been implemented through a variety of models. They are most frequently available as tethered patient portals in EHRs, but freestanding products are also offered. However, adoption of patient health records has been slow, and there are recognized barriers to their use . Increasingly, mobile health data are available through personal mobile health devices and phones that can measure heart rate, steps, oxygen saturation, and other data. Integration and use of this data can be important to patient management, and plays a growing role in the clinical record. Patients and clinicians benefit when essential relevant health information is available at the point of care. For this to occur, health information must be shared across systems. Health information exchange (HIE) efforts are focused on the problem of sharing data between EHR systems. Although progress is being made, barriers remain with interoperability between EHRs and other health information tools and systems [15,29,30]. Also, there are concerns that HIE is impeded by EHR products because information sharing between systems can be challenging . A principal challenge in HIE is the limited standardized formatting of data and a lack of common framework . Although it is common in other industries such as banking and travel, this lack of easy exchange of medical data constrains the overarching promise of EHRs. The digital environment in health care has irrevocably changed how clinicians deliver and document care. The promise of technology to deliver on improving care and outcomes, as well as enabling workflow and reducing clinician workload, has yet to be fully realized. The National Academy of Medicine (NAM) recognized the impending challenges more than two decades ago when it formed the Committee on Improving the Patient Record in Response to Increasing Functional Requirements and Technological Advances . In their report, the committee acknowledged both the benefits and the challenges of the rapid expansion of information technology in health care. As health care continues to become increasingly complex and the pace of technological change accelerates, the need to revisit the digital environment in health care has never been more pressing. 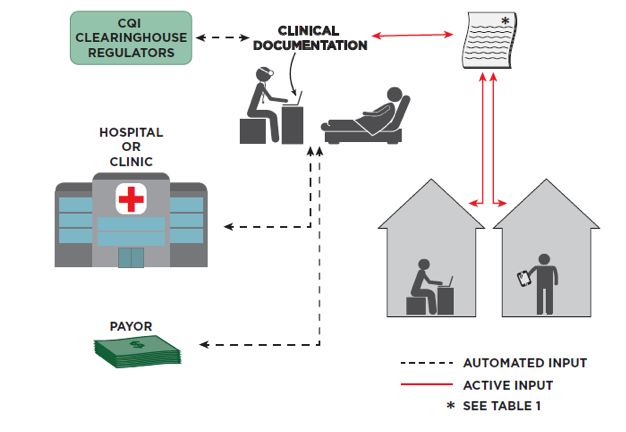 Figure 1 | Clinician EHR Systems/Tools | Source: Ommaya et al., “Care-Centered Clinical Documentation in the Digital Environment: Solutions to Alleviate Burnout,” National Academy of Medicine. Clinicians must spend increasing portions of their work time on nonclinical activities. This leads to a lack of control over their workday, a loss of collegiality while working in isolation, and interference with the patient-physician/clinician relationship as a computer screen creates a physical and psychological barrier between them . EHRs have spawned a new MD exercise known colloquially as “Pajama Time,” with mandated documentation carrying on into afterhours because of the volume of required computer tasks and the ability to complete these tasks remotely. Because of the aforementioned payment guidelines and the ease with which digital documentation allows “copying and pasting” or just adding to prior entries, the EHR has become a bloated repository of repetitive and redundant information. Recent studies indicate that, in a variety of settings, clinicians routinely use copy and paste or copy-forward and that most clinical notes are the result of copied or imported text [35,36]. The patient’s story is further lost in the fog of self-populated content that adds pages but little purpose to the notes . Another feature that an EHR has that a paper chart lacks is the ability to use templates and menus. Depending on the use, these features can either speed up or slow down use but may not necessarily improve content. 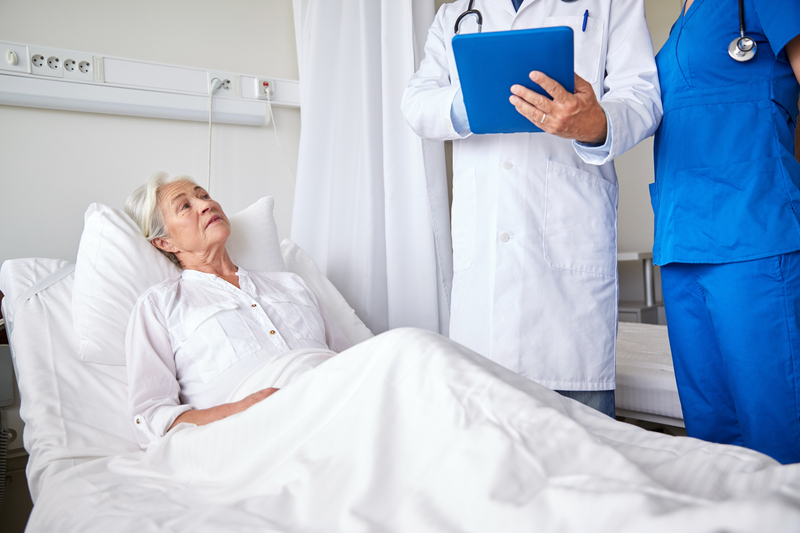 Forced characterization by selecting choices from a “pull-down” list or prewritten text prevents telling the story in the patient’s own words in as much detail as possible. Some health organizations require documentation through templates (e.g., drop-down boxes) to facilitate billing and auditing. Optimization of template design may help alleviate some of these issues. The espoused advantages of electronic health records are to help provide higher-quality and safer care along with greater efficiency to meet business goals. Some of the potential advantages are widely accepted: timely access to patient records, legible documentation, more reliable prescribing, reduction of some error-prone processes, enhanced privacy and security of data, and the potential to share information electronically with patients and other care providers. The advantages of other capabilities are less certain and have yet to be realized by the majority of patients and clinicians. These advantages include better-coordinated and efficient care, enhanced clinician and team communication, complete documentation for streamlined coding and billing, improved productivity and efficiency leading to better work-life balance for clinicians, and reduced costs with less “paperwork” as well as elimination of duplicate diagnostics. Given the investment and desire to optimize the use of EHR systems, practices and organizations rely on the broadest possible application of its use to service a diverse array of stakeholders, including but not limited to patients, clinicians, institutions, payers (public and private), vendors, research bodies, registries, regulatory bodies and regulatory counsel, and policy makers. These stakeholders have great expectations that may also create competing interests. For example, documentation methods that capture data in a structured format can help facilitate billing or data analysis for quality improvement. However, clinicians may prefer free-form methods that provide greater flexibility and may be faster than structured templates in certain instances (though the use of structured formats and free-form methods for clinical documentation are not mutually exclusive). That being said, all stakeholders rely on data for critical decision making as well as advancing business decisions. The fundamental functions driving clinical-documentation demands include traditional recording of care, automated transactions, and approaches to enable greater quality, efficiency, and informed decision making as summarized in Table 1. 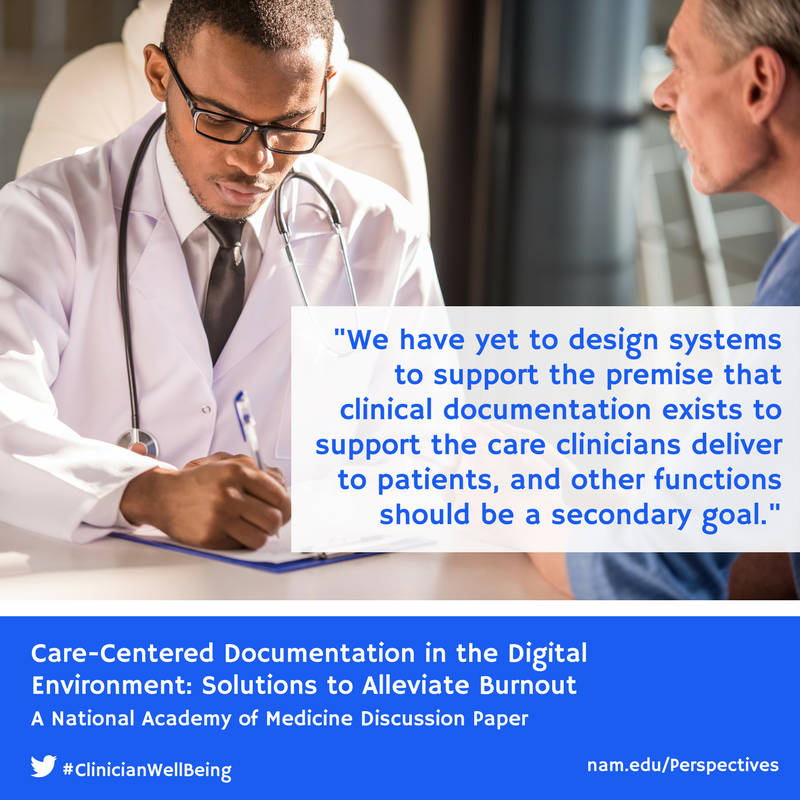 Source: Ommaya et al., “Care-Centered Clinical Documentation in the Digital Environment: Solutions to Alleviate Burnout,” National Academy of Medicine. | Note: [a] Principal elements that should be captured by the clinician during the patient encounter and recorded in clinical documentation. Up to 80 percent of information about an individual in a medical record is textual. Use of free text in clinical notes is an important part of medical documentation. It allows the clinician to go beyond structured data entry to record a more holistic view of an individual. In addition, under the Assessment and Plan sections of a progress note, clinicians describe their current assessment, along with their rationale, and plans for next steps in diagnosis or treatment. Reimagining the future of digital health information technology to support clinicians, patients, and person-centered care relies on reevaluating the current data elements collected and entries recorded in EHRs. Simplifying the breadth and depth of documentation for all clinicians should be predicated on evidence that the documentation is justified. With the introduction of EHRs, and their text-productivity tools (e.g., templates, macros, and copy-paste functionality), clinical notes have become bloated and difficult to read. This forces the next clinician to go through a process of foraging to uncover important elements of past notes. By applying specially designed natural language processing algorithms, computers are now poised to read clinical text and glean important insights from it. Natural language processing (NLP) tools have been shown to reliably extract data from clinical notes with high levels of precision in research settings for specific tasks [38,39]. Current use of NLP also allows clinicians to dictate a clinical experience and can provide structured data without the use of a template. In a study published in the Journal of Medical Internet Research, use of dictation plus NLP reduced documentation time while maintaining documentation quality . Future tools that facilitate the presentation of summary insights from the past in a succinct fashion would save clinicians time and prevent important information from falling through the cracks. Tools to help recognize the original source of text passages would help the clinician reader assess the credibility and veracity of the text, as well as know which findings are new or changed. Microsoft’s Track Changes is an example of a common editing tool that helps the reader understand the provenance of a text passage. Administrative changes, such as documentation assistance and empowered teamwork that direct data entry tasks away from clinicians, will reduce the pressure to copy and paste or copy-forward. Copy and paste can be helpful and time saving, but it must be used judiciously. Organizations have identified practices to promote safe use of copy and paste . In addition, regulatory changes that relieve clinicians of the need to document low-value text—e.g., each element of a normal physical exam, a complete review of systems, test results that are already present elsewhere in the record, and so on—will reduce the need for copy and paste. One of the drivers leading to excessive and duplicative text that is so prevalent in today’s clinical documentation is the need to comply with billing rules. Payment-driven documentation criteria are artifacts of the fee-for-service environment that has dominated American medicine for decades. As the United States moves from fee-for-transactions to value-based purchasing, policy makers should reexamine the need for documentation that serves billing needs and replace it with documentation that serves care. Ultimately, returning to the origins of clinical documentation—to communicate and facilitate care—would simplify documentation, reduce the effort dedicated to producing it, and encourage documentation of only those features that are most salient and necessary to continuing care. As health care practitioners transition from handwritten documents in paper medical records to electronically captured structured and unstructured documentation, the health care enterprise should take the opportunity to fundamentally reexamine the methods used to enter and retrieve essential care information. Instead of computerizing the paper-based methods of entering and retrieving information, design-thinking methods should be employed to elucidate an efficient method for capturing information and an efficient and effective way of retrieving the information needed to support effective decision making. The transition from paper-based record keeping to computer-based information management presents a great opportunity to fundamentally relook at the most effective way of capturing and using rich information about an individual to make the best possible decisions about health. A goal of this effort should be to improve targeting of alerts and reduce disruption in clinician workflow. In addition, the inclusion of social and behavioral data that helps drive patient-focused treatment recommendations and the incorporation of patient goals would be beneficial. Standards for automated data integration from medical monitoring devices and other IT systems will also decrease clinician burden of manual data entry . A truly advanced EHR system should provide patient-specific outcome and experience comparisons based on the treated population within the practice . Machine-learning approaches could add to existing CDSS and generate accurate differential diagnoses and determine high-value evaluation approaches . Machine-learning tools will likely assist in error detection and could improve diagnostic accuracy. Importantly, efforts to improve health IT systems must address usability or the “effectiveness, efficiency and satisfaction with which specific users can achieve a specific set of tasks in a particular environment .” A schema of the future state is presented in Figure 2. Figure 2 | The Future State of a Lean, Streamlined, User-Designed System | Source: Ommaya et al., “Care-Centered Clinical Documentation in the Digital Environment: Solutions to Alleviate Burnout,” National Academy of Medicine. To say the evolution of clinical documentation in the digital environment has become merely a source of dissatisfaction for clinicians grossly underestimates its effect on burnout. Clinicians are calling for significant redesign of clinical documentation to restore autonomy and purpose to this aspect of work, eliminate the perceived large number of actions that do not add value, and return time to clinicians for essential care activities. We recognize that the primary drivers for current capabilities in EHRs include regulatory requirements, and documentation to support coding and billing. As noted in this paper, however, the needs of clinicians and patients should be emphasized more directly and better incorporated as the primary drivers. Clinicians spend much of their time focused on documentation and related coding issues. This use of highly specialized clinical knowledge seems to be a misapplication of resources. Meanwhile, the patients have been left in their exam rooms or hospital beds wondering if all the activity going on is helping to address their needs. It is essential that clinical documentation be adequately detailed so that patients’ diagnoses and care can be understood by clinical colleagues and contribute constructively to team-based care. With the current system, we have created records that are dense, where the relevant information is challenging to find, and gaps in the consistency of what is documented are apparent. Clinicians have learned to simply jump through the hoops of adequate documentation for reimbursement. Physicians are copying and pasting previous notes, changing a few details, and potentially contributing to the increasing volume of unnecessary and irrelevant data. Recognizing that time is a limited resource for all clinicians, only essential primary data entry should be required of clinicians to support the care of a patient. The care team needs to control what documentation demands their attention with optimal capability to capture information at the point of care. Secondary uses, such as billing, should be satisfied through machine-captured data, which might be addressed in EHR certification criteria. The technology also needs to be enhanced to address the tension between structured versus unstructured documentation. Given the time that clinicians spend with inbox management, organizations should ensure that messages indicate clear action targeted to specific audiences. Having medical assistants or other support personnel support documentation (e.g., inbox management and entering patient data into the EHR) improves clinician satisfaction and reduces burnout . However, the potential for unintended consequences in data accuracy should be considered and further evaluated. Additionally, providing time in workflows during the workday to complete EHR documentation tasks enhances clinician satisfaction. Although not addressing the underlying documentation challenges, scribes or team-support mechanisms for documentation enhance physician satisfaction, increase time with patients, and advance charting efficiency . As the country transitions from pay-for-transactions to pay-for-value, the focus of documentation should return to that which supports high-quality care delivery and team communication. The original 1995 and 1997 guidelines were developed to ensure that fee-for-service reimbursement was justified. It would also be beneficial for CMS to deemphasize documentation requirements as a condition of payment for health care services. Deemphasizing (and phasing out over time) the granular documentation requirements would not only decrease the administrative work that burdens clinicians, but also improve the quality and meaningfulness of the clinical documents. CMS should clarify that elements of the HPI drafted by an assistant (MA or nurse) during rooming, and subsequently confirmed with the patient by the provider, as indicated by the provider in the medical record, should count for reimbursement. Focus on further development of health informatics capability that allows clinicians to view and understand the previous medical, health, and social history of the patient, including detail regarding diagnostic, surgical, procedure, and care plan information, will improve current EHR workflow. Ideally, richer imaging, video, and other sources of information will be included. In this system, medical history will be informed and built on the input of various treating and consulting clinicians with input and review by the patient. As a best practice, clinicians should be engaged in development, testing, optimization, and evaluation of new EHR features such as clinical decision support, order sets, and templates. EHR training is often provided in a limited number of sessions as an onboarding component. However, advanced longitudinal training and support of clinical staff improves self-assessment of competency [48,49]. The authors recommend that an authoritative body, such as the National Academy of Medicine, initiative a study focused on redesigning clinical documentation suited to the modern digital age with a primary focus on informing clinical management and improving patient outcomes and health. The study should focus on the needs of clinicians and patients in support of succinct documentation and use of informatics tools, which can facilitate and streamline workflow. See Box 1. As a result of new and emerging technology and changing consumer expectations, health care will inevitably transition to a more person- and family-centric health system requiring the interoperability of a broad array of health solutions from traditional resources, including clinicians and hospitals, to the internet of things. As we enter an era of telehealth and digital applications, we are just beginning to understand the effect of new technologies, such as machine learning and blockchain solutions, on extending the value of health care and better aligning it with the social, genetic, environmental, and behavioral determinants of health . Simultaneously, payment reform efforts are underway to support this change with new models of value-based payment that reward improved personalized health outcomes. As we study opportunities to address the existing challenges of clinical documentation, we must do so with the understanding that health care is at an inflection point and will undergo unprecedented change in the way care is delivered and paid for in the coming years. Florence Nightingale was prophetic in her 1863 critique of hospital documentation that described her difficulty in seeking information on patient care and hospital conditions, claiming, “I have applied everywhere for information, but in scarcely an instance have I been able to find hospital records fit for any purpose of comparison .” Physicians 100 years ago brought forth the idea of adequate documentation to establish their professional responsibilities to their patients and to themselves. In the present environment, clinicians have lost control of this responsibility, and it is having deleterious effects on the authenticity of their work, their sense of autonomy, patient outcomes, and the functions of the clinical environment. It is time to rethink the patient record and how it can best be used to improve person-centered care. Shanafelt, T. D., and J. H. Noseworthy. 2017. Executive leadership and physician well-being: Nine organizational strategies to promote engagement and reduce burnout. Mayo Clinic Proceedings 92(1):129-146. Shanafelt, T. D., L. N. Dyrbye , C. Sinsky, O. Hasan, D. Satele, J. Sloan, and C. P. West. 2016. Relationship between clerical burden and characteristics of the electronic environment with physician burnout and professional satisfaction. Mayo Clinic Proceedings 91(7):836-848. Kelley, T. F., D. H. Brandon, and S. L. Docherty. 2011. Electronic nursing documentation as a strategy to improve quality of patient care. Journal of Nursing Scholarship 43(2):154-162. Kazmi, Z. 2013. Effects of exam room EHR use on doctor-patient communication: A systematic literature review. 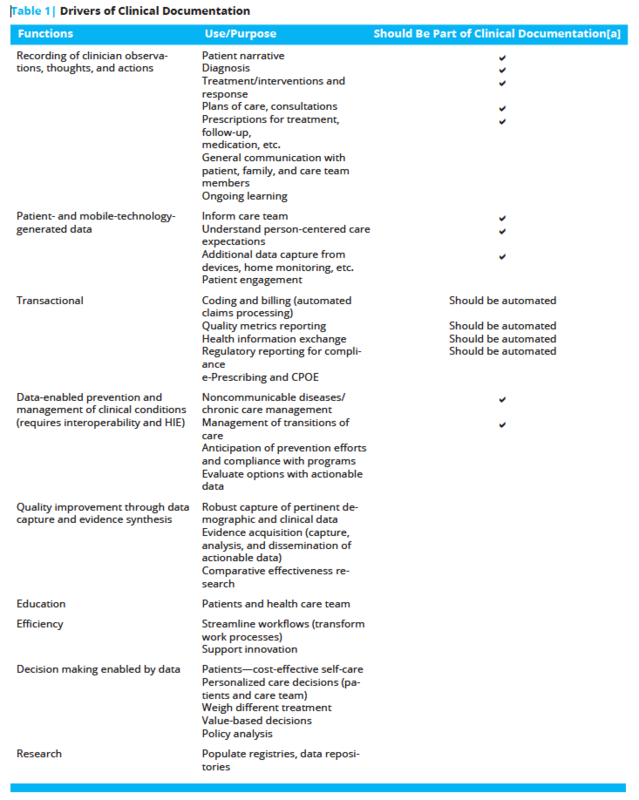 Informatics in Primary Care 21(1):30-39. Lavin, M. A., E. Harper, and N. Barr. 2015. Health information technology, patient safety, and professional nursing care documentation in acute care settings. Online Journal of Issues in Nursing 20(2):6. Dyrbye, L. N., T. D. Shanafelt, C. A. Sinsky, P. F. Cipriano, J. Bhatt, A. Ommaya, C. P. West, and D. Meyers. 2017. Burnout among health care professionals: A call to explore and address this underrecognized threat to safe, high-quality care. NAM Perspectives.Discussion Paper, National Academy of Medicine, Washington, DC. https://nam.edu/Burnout-Among-Health-Care-Professionals. Junger, S. 2016. Tribe: On homecoming and belonging. New York: HarperCollins. Kassell, L. 2014. Casebooks in early modern England: Medicine, astrology, and written records. Bulletin of the History of Medicine 88(4):595-625. Goroll, A. H. 2017. Emerging from EHR purgatory: Moving from process to outcomes. New England Journal of Medicine 376(21):2004-2006. Cheng, C. H., M. K. Goldstein, E. Geller, R. E. Levitt. 2003. The effects of CPOE on ICU workflow: An observational study. American Medical Informatics Association Annual Symposium Proceedings, 150-154. Martin, S. A., and C. A. Sinsky. 2016. The map is not the territory: Medical records and 21st century practice. Lancet 388(10055):2053-2056. Berenson, R. A., P. Basch, and A. Sussex. 2011. Revisiting E&M visit guidelines—a missing piece of payment reform. New England Journal of Medicine 364(20):1892-1895. Adler-Milstein, J., and A. K. Jha. 2017. HITECH Act drove large gains in hospital electronic health record adoption. Health Affairs (Millwood) 36(8):1416-1422. Washington, V., K. DeSalvo, F. Mostashari, and D. Blumenthal. 2017. The HITECH era and the path forward. New England Journal of Medicine 377(10):904-906. Page, N., M. T. Baysari, and J. I. Westbrook. 2017. A systematic review of the effectiveness of interruptive medication prescribing alerts in hospital CPOE systems to change prescriber behavior and improve patient safety. International Journal of Medical Informatics 105:22-30. Poissant, L., J. Pereira, R. Tamblyn, and Y. Kawasumi. 2008. The impact of electronic health records on time efficiency of physicians and nurses: A systematic review. Journal of the American Medical Informatics Association 505:508. Ali, S. M., R. Giordano, S. Lakhani, and D. M. Walker. 2016. A review of randomized controlled trials of medical record powered clinical decision support system to improve quality of diabetes care. International Journal of Medical informatics 87:91-100. Slight, S. P., E. S. Berner, W. Galanter, S. Huff, B. L. Lambert, C. Lannon, C. U. Lehmann, B. J. McCourt, M. McNamara, N. Menachemi, T. H. Payne, S. A. Spooner, G. D. Schiff, T. Y. Wang, A. Akincigil, S. Crystal, S. P. Fortmann, and D. W. Bates. 2015. Meaningful use of electronic health records: Experiences from the field and future opportunities. JMIR Medical Informatics 3(3):e30. Wolfstadt, J. I., J. H. Gurwitz, T. S. Field, M. Lee, S. Kalkar, W. Wu, and P. A. Rochon. 2008. The effect of computerized physician order entry with clinical decision support on the rates of adverse drug events: A systematic review. Journal of General Internal Medicine 23(4):451-458. Strom, B. L., J. P. Metlay, A. Cohen, B. Abaluck, A. R. Localio, S. E. Kimmel, and B. L. Storm. 2010. The role of CPOE in facilitating medication errors. Archives of Internal Medicine 170;1578-1583. Tai-Seale, M., C. W. Olson, J. Li, A. S. Chan, C. Morikawa, M. Durbin, W. Wang, and H. S. Luft. 2017. Electronic health record logs indicate that physicians split time evenly between seeing patients and desktop medicine. Health Affairs (Millwood) 36(4):655-662. Christino, M. A., A. P. Matson, S. A. Fischer, S. E. Reinert, C. W. Digiovanni, and P. D. Fadale. 2013. Paperwork versus patient care: a nationwide survey of residents’ perceptions of clinical documentation requirements and patient care. Journal of Graduate Medical Education 5(4):600-604. Van der Sijs, H., J. Aarts, A. Vulto,and M. Berg. 2006. Overriding of drug safety alerts in computerized physician order entry. Journal of the American Medical Informatics Association 13(2):138-147. Nanji, K. C., S. P. Slight, D. L. Seger, I. Cho, J. M. Fiskio, L. M. Redden, L. A. Volk, and D. W. Bates. 2013. Overrides of medication-related clinical decision support alerts in outpatients. Journal of the American Medical Informatics Association 21(3):487-491. Murphy, D. R., A. N. Meyer, E. Russo, D. F. Sittig, L. Wei, and H. Singh. 2016. The burden of inbox notifications in commercial electronic health records. JAMA Internal Medicine 176(4):559-560. Showell, C. 2017. Barriers to the use of personal health records by patients: a structured review. PeerJ 5:e3268. Adler-Milstein, J., S. C. Lin, and A. K. Jha. 2016. The number of health information exchange efforts is declining, leaving the viability of broad clinical data exchange uncertain. Health Affairs (Millwood) 35(7):1278-1285. Everson, J. 2017. The implications and impact of 3 approaches to health information exchange: community, enterprise, and vendor-mediated health information exchange. Learning Health Systems 1(2):1-9. e10021. Adler-Milstein. J., and E. Pfeifer. 2017. 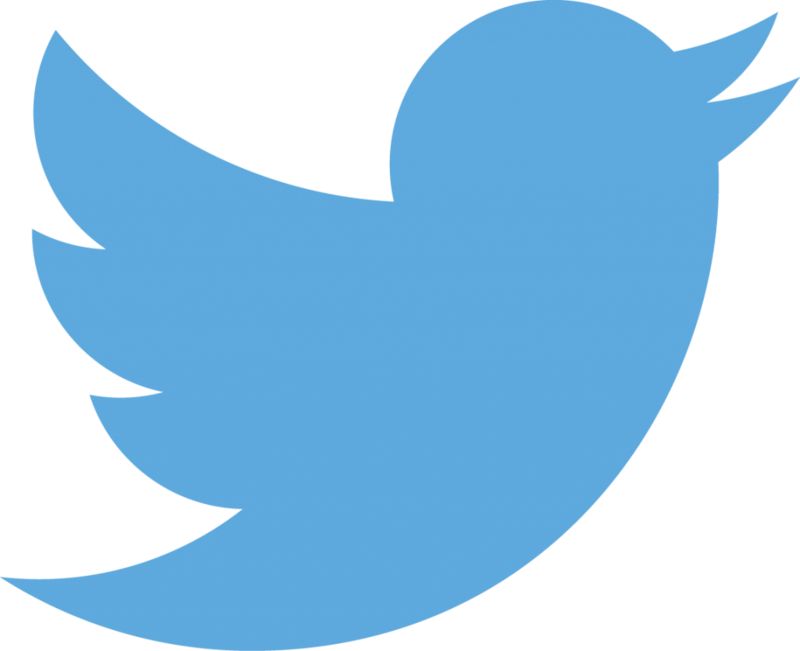 Information blocking: Is it occurring and what policy strategies can address it? Milbank Quarterly 95(1):117-135. National Quality Forum. 2017. Measure framework to assess nationwide progress related to interoperable health information exchange to support the national quality strategy. Washington, DC. National Quality Forum. National Academy of Medicine. 1997. The computer-based patient record: An essential technology for health care. National Academy Press: Washington, DC. Friedberg, M. W, P. G. Chen, K. R. Van Busum, F. Aunon, C. Pham, J. Caloyeras, S. Mattke, et al. 2014. Factors affecting physician professional satisfaction and their implications for patient care, health systems, and health policy. RAND Health Quarterly 3(4):1. Wang, M. D., R. Khanna, and N. Najafi. 2017. Characterizing the source of text in electronic health record progress notes. JAMA Internal Medicine 177(8):1212-1213. Tsou, A. Y., C. U. Lehmann, J. Michel, R. Solomon, L. Possanza, and T. Gandhi. 2017. Safe practices for copy and paste in the EHR. Systematic review, recommendations, and novel model for health IT collaboration. Applied Clinical Informatics 8(1):12-34. Siegler, E. L. 2010. The evolving medical record. Annals of Internal Medicine 153(10):671-677. Sauer, B. C., B. E. Jones, G. Globe, J. Leng, C. C. Lu, T. He, C. C. Teng, P. Sullivan, and Q. Zeng. 2016. Performance of a natural language processing (NLP) tool to extract pulmonary function test (PFT) reports from structured and semistructured Veteran Affairs (VA) data.The Journal for Electronic Health Data and Methods(Washington, DC) 4(1):1217. doi: 10.13063/2327-9214.1217. eCollection 2016. Liu, L., N. H. Shorstein, L. B. Amsden, and L. J. Herrinton. 2017. Natural language processing to ascertain two key variables from operative reports in ophthalmology. Pharmacoepidemiol Drug Safety 26(4):378-385. doi: 10.1002/pds.4149. Epub 2017 Jan 3. Kaufman, D. R., B. Sheehan, P. Stetson, A. R. Bhatt, A. Field, C. Patel, and J. M. Maisel. 2016. Natural language processing-enabled and conventional data capture methods for input to electronic health records: A comparative usability study. JMIR Medical Informatics 4(4):e35. Weaver, C., and A. O’Brien. 2016. Transforming clinical documentation in EHRs for 2020: Recommendations from University of Minnesota’s big data conference working group. Studies in Health Technology & Informatics 225:18-22. Zulman, D. M., N. H. Shah, and A. Verghese . 2016. Evolutionary pressures on the electronic health record: Caring for complexity. Journal of the American Medical Association 316(9):923-924. Szlosek, D. A., and J. Ferrett. 2016. Using machine learning and natural language processing algorithms to automate the evaluation of clinical decision support in electronic medical record systems. The Journal for Electronic Health Data and Methods (Washington, DC) 4(3):1222. Schoeffel, R. 2003. The concept of product usability. International Organization for Standardization Bulletin 34:6-7. Linzer, M., S. Poplau, E. Grossman, A. Varkey, S. Yale, E. Williams, L. Hicks, R. L. Brown, J. Wallock, D. Kohnhorst, and M. Barbouche. 2015. A cluster randomized trial of interventions to improve work conditions and clinician burnout in primary care: Results from the Healthy Work Place (HWP) study. Journal of General Internal Medicine 30(8):1105-1111. Gidwani, R., C. Nguyen, A. Kofoed, C. Carragee, T. Rydel, I. Nelligan, A. Sattler, M. Mahoney, and S. Lin. 2017. Impact of scribes on physician satisfaction, patient satisfaction, and charting efficiency: A randomized controlled trial. Annals of Family Medicine 15(5):427-433. Abrahamson, K., J. G. Anderson, E. M. Borycki, A. W. Kushniruk, S. Malovec, A. Espejo, and M. Anderson. 2015. The impact of university provided nurse electronic medical record training on health care organizations: An exploratory simulation approach. Studies in Health Technology and Informatics 208:1-6. Kim, J. G., H. P. Rodriguez, K. A. Estlin, and C. G. Morris. 2017. Impact of longitudinal electronic health record training for residents preparing for practice in patient-centered medical homes. The Permanente Journal, 21. Yli-Huumo, J., D. Ko, S. Choi, S. Park, and K. Smolander. 2016. Where is current research on blockchain technology? A systematic review. PLoS One 11(10):e0163477. Nightingale, F. 1863. Notes on Hospitals, 3rd ed. London: Longman, Green, Longman, Roberts, and Green. p. 176. Alexander K. Ommaya, DSc, MA, is the senior director of Clinical Research and Policy at the Association of American Medical Colleges. Pamela F. Cipriano, PhD, RN, NEA-BC, FAAN, is the president of the American Nurses Association. David B. Hoyt, MD, FACS, is the executive director of the American College of Surgeons. Keith A Horvath, MD, is the senior director of Clinician Transformation at the Association of American Medical Colleges. Paul Tang, MD, MS, is the vice president and chief health transformation officer at IBM Watson Health. Harold L. Paz, MD, MS, is the executive vice president and chief medical officer at Aetna. Mark S. DeFrancesco, MD, MBA, FACOG, is a past president of the American College of Obstetricians and Gynecologists. Susan T. Hingle, MD, is chair of the Board of Governors at the American College of Physicians. Sam Butler, MD, is the chief medical officer at Epic. Christine A. Sinsky, MD, is the vice president of the American Medical Association. The authors would like to acknowledge Colin P. West, MD, PhD, Mayo Clinic and Patricia Sengstack, DNP, RN-BC, CPHIMS, Bon Secours Health System for their valuable contributions to this paper. The authors would also like to thank Charlee Alexander, program officer; Mariana Zindel, research assistant; and Imani Rickerby, program assistant at the National Academies of Sciences, Engineering, and Medicine for the valuable support they provided for this paper.